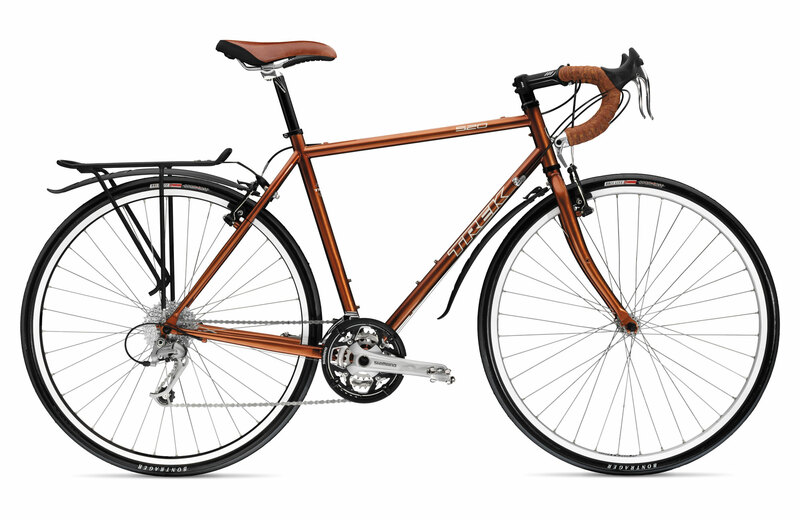 For our 4th touring bike option I’m going to go with a very well-known touring bicycle, the Trek 520 from Trek Bicycles. Please comment if you have ever ridden, owned, or know anyone who owns this bike. Email photos of your setup to me at recklesscognition@gmail.com and have them posted on this site. The Trek 520 is a very well-known touring bike with a great reputation in the middle area of the price range. This bike is often used when comparing the lower-end and higher-end models and is a great place to start when looking for a quality bike. I’ve ridden a Trek 4800 and a Trek 7.2 on tours before and was more than happy with their performance. I’ve heard the 520 more than lives up to its reputation as a quality, strong, and reliable touring bike. The issues with this bike include an uncomfortable stock saddle that is far too hard for many riders and slightly sub-par racks and fenders (mud-guards) that can’t support big weight. The strengths of the bike include it’s stability, strength, and smooth ride. I suggest comparing this bike to the Cannondale Touring 2, as the price is right on. I’m giving the Trek 520 a low value rating because I don’t really like what you get for this price. $1,300 and you’re still only getting entry-level Deore LX components. It comes in slightly ahead of the Cannondale Touring 2 because the Trek has a complete LX line, whereas the Cannondale swaps in some cheaper components with the LX. Quality. There aren’t many complaints about the Trek 520. Compliance. This bike is a truly dedicate touring bike. It is basically ready to go. The Trek 520 is a fantastic bike. I’m on a tour with some friends right now and one of them was riding some new Motobecane aluminum road bike. No good. But then we stopped by some used sports shop and found an old 520 in great condition for $100! Total steal as it had all of the great old RX100 and Deore DX stuff. That’s one comment I would make about your breakdown of the 520. Find an older one. They are way better quality, will last longer and will save you 1,000 bucks. Chiblam Chiblooey! My comment is more of a question. Do you have any information on what the fenders on the old 520 were and if they’re sold anywhere? I really don’t want to go with all out touring fenders, but I can’t find any of the style pictured above that would fit under the rack and frame. I realize that your question is nearly a year old, but just in case you were still curious… The fenders in this photo look to me like the Bontrager Satellite fenders: http://www.bontrager.com/model/06536 I have a set of them on my Dual Sport, and they work fairly well. They also include quick-release attachments for easy on and off. Just a note, though: the rear fender rattles like hell against the rack and is very noisy as a result when there’s nothing attached. 1) The front fender did a good job protecting the frame from rocks, but a terrible job catching on spray from the front tire. I didn’t want to get sprayed in the face anymore. 2) The rear fender was a little noisy with the rear rack, but that’s not what bothered me. Overall it just wasn’t big/wide enough to catch all the spray from the rear tire and my trunk bag would end up with soaking through from the spray. After a little research I arrived at the Planet Bike Cascadia Fender Set Hybrid/Touring (http://www.amazon.com/Planet-Bike-Cascadia-Fender-Touring/dp/B00474P0OQ/ref=cm_cr_pr_product_top). They took a bit of elbow grease to get on properly, but they work much better at blocking rain. The front fender still leaves a little bit to be desired and I wish it was an inch or two longer. I rescued an old 520 from a secondhand shop a few years ago and have been rebuilding it for my trip around the world (www.bikearoundtheworld.typepad.com). These old 520s are sturdy, reliable bikes and are a lot of fun to ride.